By default, all internal network zones are isolated by the Smoothwall. Zone bridging modifies this in order to allow communication to take place between a pair of network zones. Defines the two network zones between which the bridge exists. Defines whether the bridge is accessible one-way or bi-directionally. Defines whether the bridge is accessible from an individual host, a range of hosts, a network or any host. Defines whether the bridge allows access to an individual host, a range of hosts, a network or any hosts. Defines what ports and services can be used across the bridge. Defines what protocol can be used across the bridge. It is possible to create a narrow bridge, for example, a one-way single-host to single-host bridge using a named port and protocol, or a wide or unrestricted bridge, for example, a bi-directional any-host to any-host bridge using any port and protocol. Zone bridging rules enable communications between specific parts of separate internal networks. 1. Go to Network > Filtering > Zone bridging. • Source interface — From the drop-down list, select the source network zone. • Destination interface — From the drop-down list, select the destination network zone. • Bi-directional — Select to create a two-way bridge where communication can be initiated from either the source interface or the destination interface. Ignore this option to create a one-way bridge where communication is initiated from a single interface. • Protocol — From the drop-down list, select a specific protocol to allow for communication between the zones, or select All to allow all protocols. • Source IP — Enter the source IP (for an individual network host), IP address range (for example, 192.168.10.1-192.168.10.15), or subnet range of IP addresses (for example, 192.168.10.0/255.255.255.0 or 192.168.10.0/24) from which access is permitted. To allow access from any host in the source network, leave this parameter blank. • Destination IP — Enter the destination IP (for an individual network host), IP address range (for example, 192.168.10.1-192.168.10.15), or subnet range of IP addresses (for example, 192.168.10.0/255.255.255.0 or 192.168.10.0/24) to which access is permitted. • Service — From the drop-down list, select the services, port range or group of ports to which access is permitted. 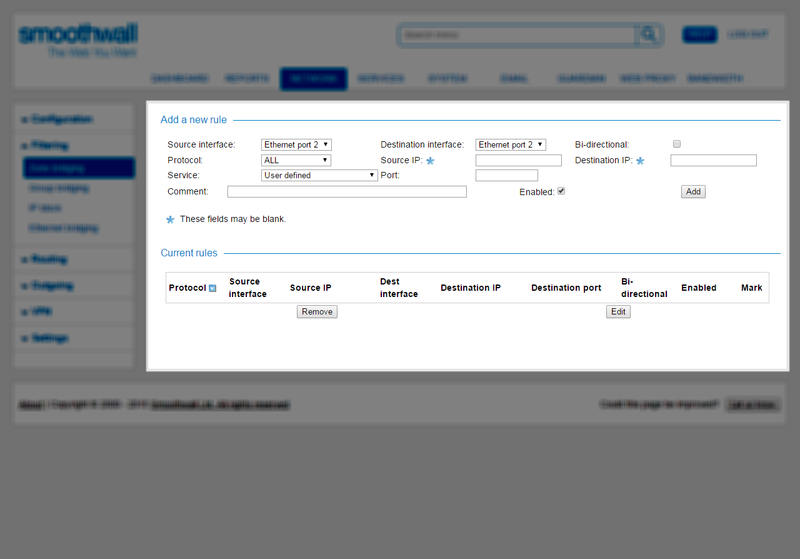 Or select User defined and leave the Port field blank to permit access to all ports for the relevant protocol. Note that this is only applicable to TCP and UDP. • Port — If User defined is configured as the Service, specify the port number. Or leave the field blank to permit access to all ports for the relevant protocol. • Enabled — New zone bridging rules are enabled by default. Clear the check box to create a disabled rule. 3. Click Add. The rule is added to the Current rules table. 4. Edit the configuration as required. For a detailed description of each setting, see Creating Zone Bridging Rules. Contains local user workstations and confidential business data. Note: The DMZ network zone is a DMZ in name alone – until appropriate bridging rules are created, neither zone can see or communicate with the other.  Allows restricted external access to a web server in the DMZ, from the Internet.  Does not allow access to the protected network from the DMZ.  Allows unrestricted access to the DMZ from the protected network. A single zone bridging rule will satisfy the bridging requirements, while a simple port forward will forward HTTP requests from the Internet to the web server in the DMZ. Hosts in the Protected network will now be able to access any host or service in the DMZ, but not vice versa. Multiple zone bridging rules can be used to further extend the communication allowed between the zones. As a extension to the previous example, a further requirement might be to allow the web server in the DMZ network to communicate with a confidential database in the Protected network.